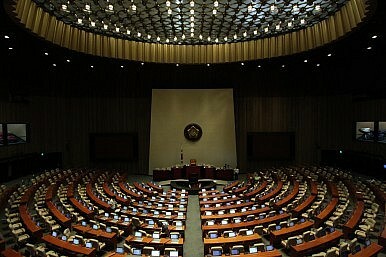 After being in a “vegetative state” for months, the South Korean National Assembly has begun passing laws again. While the unexpected high-profile visit of Hwang Pyong-so and Choe Ryong-hae has dominated headlines, an important development recently took place in South Korea’s National Assembly. The two parties had been at loggerheads over the Sewol bill, which will set up a committee to investigate the causes of the ferry’s sinking on April 16 of this year. There were two main disagreements: 1) victims’ family participation in the investigation process; and 2) giving indictment power to the investigating committee. President Park Geun-hye and the ruling party refused to grant these provisions. Both sides seem to have overcome these disagreements. According to a short summary of the new agreement, each party will choose two members of a seven-member committee, while the Ministry of Justice, the National Court Administration and the Korean Bar Association will select the other three. President Park will choose a lead prosecutor among four candidates selected by the two parties. The process by which candidates are forwarded for the position of lead prosecutor has yet to be determined. It is unclear whether the victims’ families will have any role. In addition to passing laws and finding common ground on the Sewol bill, two additional political developments directly involving the national assembly are worth considering. First, Park Young-sun’s resignation as NPAD floor leader. Shortly after reaching an agreement with the ruling party, Park announced she would step down from her leadership position. She was the first woman to hold a floor leader position for a major political party in South Korea’s National Assembly. This marks the second leadership post Park has stepped down from. From August 4 through September 17, she was the party’s interim chairwoman after co-chairs Ahn Cheol-soo and Kim Han-gil stepped down. But in mid-September Park stepped down from this position as interim chair. The article cites the immense difficulty she had in negotiating between the Sewol victims’ families and the Saenuri party (agreements she helped broker fell through two times). Also cited is her difficulties within the party, specifically the intra-party brouhaha following her nomination of Lee Sang-don, a political conservative, to co-lead a party “emergency committee;” this committee, created last month, is tasked with maintaining party cohesion until the party general election. As Park’s frustration indicates, factional feuds within the party have hampered its ability to operate on a unified platform. The second additional development is the call for a constitutional amendment to revise South Korea’s political system from a presidential system to a semi-presidential system. The Joongang Ilbo reports that members of the “Meeting of Lawmakers Pushing the Amendment of the Constitution” are leading the initiative. The group consists of 152 lawmakers from the ruling party and opposition camp. In a semi-presidential system, the president and the prime minister share power and the cabinet (lead by the prime minister) is responsible to the legislature. The political scientist Maurice Duverger first coined the term “semi-presidential system” to describe the French 5th Republic. Current impetus for the amendment largely stems from the lengthy legislative stalemate caused over disagreements regarding the Sewol bill. The Joongang article includes pro-amendment Saenuri lawmaker Lee Jae-oh reflecting on the months-long political stalemate during which not a single bill was passed. Specially, Lee is quoted as saying, “if the administration was decentralized [as it is in a semi-presidential system], cabinet members would have stepped down and a new cabinet would have been established to stabilize the political situation much earlier.” While Lee, and others, may be arguing for a constitutional amendment, less ambitious lawmakers simply want the National Assembly Act revised. Although the methods differ, either adjustment would attempt to address the crippling effect of the opposition veto, which I have previously discussed in greater detail. For now, the National Assembly seems ready to execute its most basic function: law making. It will be a challenge, however, for the liberal party to maintain a semblance of internal cohesion and cooperate with the ruling Saenuri. Another significant disagreement could send the assembly back to its “vegetative state.” Perhaps constitutional reform is not such a bad idea after all? Already candidates are emerging for the next presidential elections.